1. August, 2009. 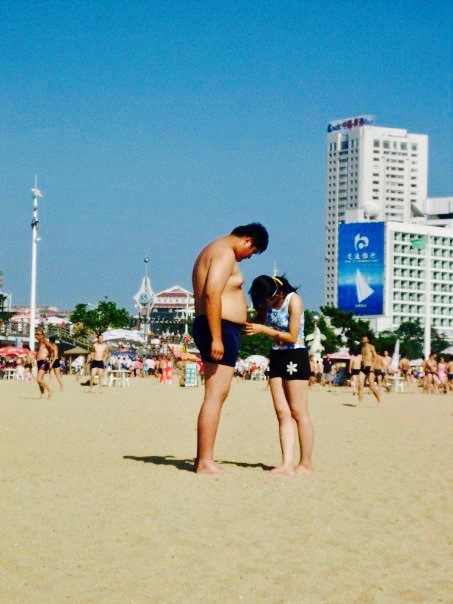 I’ll never forget my first beach experience in China way back in the summer of 2009. S and I were in the midst of an extensive tour around Shandong Province and had really fallen for the charming coastal city of Qingdao. It was proper beach weather during our stay with high temperatures and clear blue skies, so naturally we put a day aside for the city’s famous albeit uninspiringly named Number One Bathing Beach. To this day I have never seen such a saturated stretch of sand! 2. August 2009. I took some amazing photos that day; a collection of shots that were ultimately doomed when the hard drive I’d been storing them on was accidentally knocked off our living room table. The photos you’re looking at now are thumbnails pulled off Facebook, literally the only copies I have. Oh, the regret. This is Qingdao’s version of Muscle Beach, where the guys tale themselves very seriously indeed. I remember saying hi and getting no reply. 3. August 2009. Thankfully there were plenty of friendly people on Number One Bathing Beach that day and, as was the way that summer, we were the focus of much attention as pasty-skinned foreigners. The sea in Qingdao was nothing to shout about as you can see from this shot, a lackluster dirt-brown. 5. August 2009. With my advancing years showing no sign of abating and so much of the world still to see I doubt I’ll ever get back to Qingdao for the photographic justice it so richly deserves. If you’re in the region don’t hesitate to check out this vibrant city and its curious beach culture where barely anyone can actually swim and sunbathing isn’t a thing. From the city centre Number One Bathing Beach can be reached via the metro. Jump off at Huiquan Guangchang (Line 3) at Exit C; it’s just a three-minute walk from there. The beach is free to enter and you won’t be charged a penny for all the staring you’ll receive throughout the day. I lived and worked in China for a while–Wuxi in Jiangsu Province–but couldn’t bear not seeing the sun for months at a time. Your photos of Number One Bathing Beach sort of sum up my experiences in this fascinating, but densely populated, country. Hey Henry, thanks a lot of for taking the time to stop by and comment. Where are you based these days?